Three years ago, Kitano High School's first AET initiated a small English group where they met every week to practice English conversation. Over the past couple of years, the number of members gradually increased and formed the present ESS, or English Speaking Society group, which now consists of 21 members. For the past year, I have had the pleasure of speaking to the first and second year student members in ESS meetings twice a week. Through various activities, students are encouraged to practice their English either with their fellow ESS mates or myself. All meetings are informal. Usually, we gather after school and chat about their school life, their other club activities, movies that the members have recently seen.....ect. We also play games that in some way incorporate English such as "hang-man" or "charades." Other meetings are reserved for English cinema, in which I bring in a video with Japanese subtitles. This is usually a good chance for the members to get acquainted with native English conversation (though one time I accidentally brought in a video that was dubbed in Japanese!!) 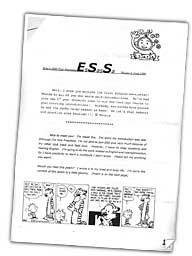 In addition to practicing English conversation, members also have an opportunity to boast their writing skills by contributing to the monthly ESS newsletter which the members have humorously named EsSasSa. Members can contribute anything they wish, as long as it is in English. For example, poems, articles, cartoons...ect. From my perspective, the greatest joy for me through the ESS club is to interact with the students in an out-of-class setting in which the students feel more comfortable and are able to speak freely without worrying about mistakes. To my pleasant surprise, I have noticed a considerable difference in the second year student members' ability and confidence in English (former first year members). And how they improve every week!! As some members say, ESS club "spices up their English!"